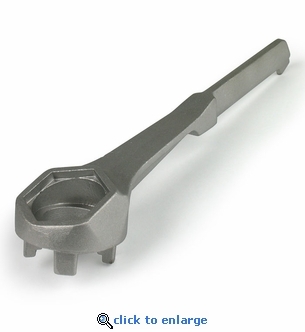 This cast aluminum non-sparking bung wrench will cap and uncap 15, 30 and 55 gallon long term water storage barrels and drums. Designed with an offset handle to reduce stress and protect knuckles during use. Removes a variety of bung sizes and fittings. Dimensions: 10.5" x 2.25" x 1.75"